Kent mentioned that one of his current perks with his project is his ability to work remotely from any location. Similarly, Anson’s work allowed him the flexibility to complete it from any location. I laughed as I said it. But the tranquil tea-sipping atmosphere intensified, and eyes brightened as they pondered on the idea. At the end of the night, we just shook our heads, shrugged our shoulders, and said to each other, “We’ll see. If Montreal is a go, then we’ll talk again”. Fast forward to Wednesday, January 4. I receive the critical email. I’m going to Montreal next week. You’re probably thinking that our itinerary looks pretty sparse right? Well, we knew that for a work trip, our number one priority was to allocate time for work. Everything else (including the vacation aspect) would have to be planned during our free time. But, given our limited time, I think we did a pretty great job, mixing in a combination of sightseeing, sports, and eating in a tighter timeframe. For those who are interested in how the itinerary was thrown together, well it was done on the hour! Read on to see how it all unfolded. I feel like such a baaaaaaauuuuuussss! Questions like: Is it truly better to arrive late than ugly? This was the first time that we didn’t have a theme song to go with our trip – all because there was so much to talk about. Is this a sign that we’re getting senile? We’ve already hit record conversation/squatting levels whenever we have dim sum together. Sometimes we don’t even get the bill until 6 hours after we were seated! To be able to talk non-stop without food as a distraction is definitely a new level for us. When we finally arrived to Montreal, we made a beeline to our hotel to rest up, drop off our stuff, and decide how to spend our afternoon. It was supposed to be a quick pit stop. But, upon arrival, the concierge apologetically told him that our room was ‘upgraded’. Nice. I don’t think anyone would ever be upset about an upgraded room. As you could tell from the snap… I certainly wasn’t hating the situation! Making things all the sweeter, was that thanks to Kent’s previous travel work assignments, he had a number of IHG points racked up and this hotel stay was essentially free. Free hotel, free upgrade. I don’t think we could have asked for anything better. As a result, we ended up staying in the hotel for two hours enjoying the room amenities. By the time we headed out, it was dinner time. Food became our priority and as any typical tourist, our priority was to try the location’s most famous foods. When in the province of Quebec, we must POUTINE. We ate at Poutineville’s Avenue du Parc location and we all agreed that somehow the cheese curds here were just so much better here than whatever we could find in Toronto. It could also be that -20 degree weather and hot gravy with chewy cheese and potatoes makes for a wonderful combination. Because our stay in Montreal was so short and most of our hours were spent working, we really tried to maximize our free time during the weekend before work began. As such, there was no rest for us after dinner! Number two on Trip Advisor’s Things to Do in Montreal 2017, was Mont-Royal for its scenic lookout. Other tourists commented that heading up to Mont Royal is best done at night – luckily that was the only option we had. So off we went in freezing cold weather to view the night skyline. I’m not really sure how it happened but we ended up staying for an hour trying to take our best shot of the view. But with the -20 degree weather, our stiff fingers, chattering bodies, and a lack of a tripod resulted in many blurry images. Then, when we thought our fingers could no longer bear the cold…. fireworks started happening in the top left corner of our viewpoint. It lasted for over half an hour and was yet another unexpected and pleasant surprise for us. 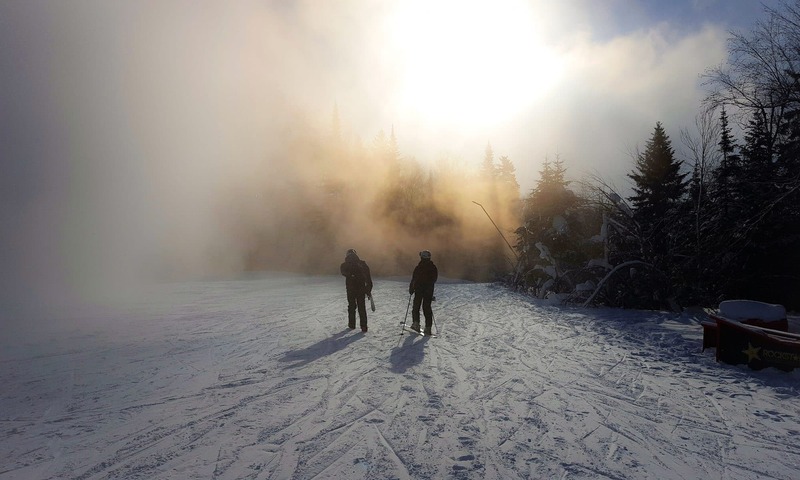 Our day was all about skiing and snowboarding at Mount Tremblant. It was the first time some of us rode in the 15-minute long gondola up the mountain. What a nice and toasty way to get to the top! We were well prepared for this day’s outdoor activities thanks to last night’s lesson of frozen toes and fingers. Each of us wore four layers of clothing, as many as three pairs of socks, and two layers of pants underneath our jackets and snow pants. Balaclavas and/or Buffs, too were essential. We even had hand warmers and toe warmers stuffed in our pockets, ready to be ripped open at a moment’s notice in case our digits freeze. Overall, coming over prepared for the cold was a boon for us as we whipped down the mountainside. With the windchill, it was easily -25 degrees C or colder and any exposed skin smarted in a few minutes. Even though the day ended at 3 pm, our tired bodies were ready for bed. Kent drove us back to Montreal that night, and after parking and checking in, the last thing we wanted to do was explore the city once again. So we settled for a nearby St. Hubert’s, bought takeout, and One-Punch Man’ed the night away. Anson: If you are interested in watching it… go for it! It should be good tickets? Kent: He just sent them to me. Anson: The extra ticket is in my inbox. Day three marked the first day of my training and another regular workday for Kent and Anson. Although Kent could work remotely for his projects, it was also possible to head into his satellite office as well. He decided to pay it a visit today. As luck would have it, his visit resulted in two free tickets to the night’s hockey game. We weren’t really hockey fans.. and really didn’t know much about it in general but we figured, it is another new experience for us! So …. let’s go! We bought another last-minute ticket (for $25!!!) so that all three of us could go watch the game and our unplanned night was suddenly filled. With all the patriotic spirit we could muster, we cheered for the Montreal Canadiens as they took on the Washington Capitals. Even though they lost 5-1, it was still a fun night filled with gasps of anticipation, clenched fists, hot dogs, and groans of disappointments as puck after puck missed the goal by jussssttt a little bit each time. By the end of the night, we still didn’t know who all the players were but all three of us learned to appreciate what makes seeing Hockey Live that much more exciting. With all that hockey excitement, it was difficult to head to bed on time. By the time I settled into bed it was passing 12 am. We thought the night was over. But OH. IT WAS NOT. More adventures were to be had! Our hotel’s fire alarm went off at 12:30am – just as was I about to fall into deep sleep. It didn’t stop… and our group lazily got out of our beds, thinking that someone pulled a prank on the hotel. We grabbed some warm clothes, and groggily complained – refusing to exit our room. It took five minutes of bed rolling and another three minutes of shuffling before we assembled ourselves at the front of our door. When we opened the door, smoke filled our lungs, and blurred our vision – like a misty morning day. So it wasn’t a joke. There was actually a fire. In our hotel. We took the fire escape route, and with each step down the stairs, the smoke became steadily thicker and heavier. The stench of burning plastic filled the air. It soaked into our clothes and lodged itself into our throats. Thankfully, the hotel was only three stories high, so escape was quick. However, the fire happened on the main floor, where the smoke was at its thickest. The last few steps to our escape felt the most desperate. Later, the firefighters told us this was a small fire. The instinctual ‘fight or flight’ response was heavily leaning towards ‘flight’ that night. To me, those final few steps felt like I was walking into the fire, not away. The gust of fresh air through the open door was a relief to my senses. At our exit, we were accosted by the firefighters, who were already alerted by the other hotel guests. An hour later, we were back inside. It still smelled a little smoky but the building was very much intact with no visible damages anywhere. This wasn’t the first time Maria & Co had a fire accident in our travels, but it was the first time that we witnessed and experienced up close. I think next time, our group is going to react a little quicker to fire alarms – prank or not! Another day of work for us all – Anson yet again enjoying the luxuries of the loft to himself, and Kent, yet again visiting the satellite office. After last night’s free tickets, he dutifully returned to the office to report the loss. Midday into my training, it became apparent that I would be ending later than usual. Our group still wanted to visit a number of places recommended by our friends and family. We needed to come up with a plan to hit up as much as we could as this would be our last night together before Kent and Anson drove back home. A historical establishment visited by my dad when he did business in Montreal many many years ago, and legendary stories passed on by friends have elevated this deli’s status to meat lover’s heaven in my family. It is one of those places that people either scoff at stating how ‘over-hyped’ it was or raved about for their legendary smoked meat sandwich. I, for one, have only met people who raved about it. As such, I have made it a tradition for me to at least stop by and have a sandwich from here whenever I’m in town. To me, visiting Montreal would be incomplete without a steaming pile of just-so fatty brisket, thinly sliced layers sandwiched between two slices of bread. Like the poutine, some things are just better here than in Toronto. Kent, on the other hand, never had a single smoked meat sandwich and had his doubts about this mysterious smoked meat sandwich. “I heard its just like a corned beef sandwich… and last time I had a corned beef sandwich I was pretty meh about it”. Anson and I agreed, that as friends, we could not let Kent leave Montreal without a trying at least ONE of Montreal’s smoked meat sandwiches. It didn’t even have to be from Schwartz, but there needed to be a smoked-meat sandwich. I was really pushing for Schwartz because of the nostalgic warm fuzzy memories of eating there with various groups of people. Personal nostalgia aside, I think their medium-fatty brisket was the best out of the three smoked meat sandwich locations (Reubens and the airport) I’ve tried in Montreal. This came recommended from a co-worker of mine who went to McGill during her university years. When I told her where I was going, she was so excited to give out a list of place to eat and places to drink. This came as one of her first recommendations for drinks. With an unlabelled entrance typical of many speakeasy-style bars and the ability to reserve an entire whisky bottle and have it displayed on its ceiling, this was the most intriguing recommendation of them all. When I shared this with Kent and Anson, they too, seemed interested in finding this bar’s entrance. The anticipation of the extra dopamine reward from playing hide-and-seek with this bar’s entrance definitely added to the appeal. It was 7 pm before we all managed to wrap up our training and work. Anson, who had to most flexible hours, was able to take a lunch break and walk to Fairmount Bagel to pick up a dozen bagels. By the time Kent and I arrived home, we had delicious bagels and brie cheese waiting for us. Thank you Anson! From the moment we all finished work, there was no time to lose and no room for mistakes. We needed to eat smoked meat, find Big in Japan and drink some alcohol, and make it back to the hotel before 10 PM! We were working after all – so sleep was still an essential part of our day. 15 minute walk to Schwartz? Followed by another 10 to Big in Japan? No problem! Maybe, we could even get TWO drinks instead of one. How ambitious of us. So off went to Schwartz. We walked… and walked… and walked. Icy snowflakes hit our faces as we trudged along, stomachs growling. We rounded a corner, walked down a street, and saw the deli. But something was off. The deli lights were dark, it was empty. We checked our phones. Schwartz was supposed to be open until 12:30am today. Was Yelp giving us unreliable business hours again? No, turns out that after 8 pm today, Schwartz was finally taking a much needed holiday rest and was hosting their Christmas party tonight – on Tuesday, January 10, 2017. It was 7:54pm. The chairs at the deli were already up… did we have to give up our hope of smoked-meat goodness? No. The Schwartz deli was gracious. They forgave our lateness and our ignorance for not knowing it was their holiday night. The man behind the counter waved his arm in, indicating we could enter. “What do you want?” said the counter-man as he rolled up his sleeves. “Three smoked-meat sandwiches please!” said Anson, cash in hand, waving it in the air to whoever would accept the payment. “Guys, do you have extra change?” he whispered. “I don’t have enough for tip!”. Kent and I whipped open our wallets and proceeded to dump out all our coins. I don’t really know how much we tip we gave that night. So blind with gratefulness were we that we just gave all the coins we had. It must have been a lot because I vaguely remembering an appreciative nod, and a grunt of satisfaction from the counter-man with his eyebrows raised. We got the goods in small brown paper bags and we excused ourselves from the closed deli. All the chairs were stacked and it was after eight, so we decided to eat outside the store front, loitering around with our warm-packaged reward in our hands. That first bite in the open-air was probably the most delicious and grateful bite I’ve had in a long while. The hunger combined with the nostalgic rush of other smoked-meat memories and the narrowly missed opportunity overcame my senses. To me, it wasn’t just about the burst of flavours (indeed it was every bit as well-spiced, juicy, and tender as I remembered it), but the experiences and circumstances that come with it. It made this visit all the more delicious. As you can tell, Kent and Anson were also very pleased with the circumstances. With the last scrap of meat in our mouths, we threw our paper bags in the nearest trash bin and proceeded to hunt for the single, black door between two silver pillars – the telltale sign we made it to Big in Japan. For ten minutes, we walked outside, eyes peeled for signs of this description. When we finally found it, we rejoiced! It was just before 9 pm. There was enough time for a drink before we headed home! While we didn’t reserve a whiskey bottle on the ceiling, it was still a treat to be able to see so many hanging bottles. The service was amazing, the atmosphere was cozy and felt like it was perfectly made for quiet discussions. We were able to reminisce about our current trip and marvel at how everything came together over Japanese-inspired cocktails. Another successful night, another successful trip.